Ivan the Terrible (1530-1584) - The first Russian monarch to take the title of "Tsar" and the first leader of all the Russian people. His predecessors had been known as "Grand Prince of Moscow", and ruled primarily over the Muscovite city. He also has perhaps the most notorious cognomen in history (along with Vlad the Impaler), which in Russian means "Ivan the Fearsome". It was his long reign (from 1547 until his death) and his conquests which transformed Russia from a small kingdom into an empire. The first year of his rule was marked by a major tragedy, the Moscow fire of 1547, which burned down much of the city and killed about 4,000 people. But other than that, the first half of his reign was considered relatively stable, and led to a number of achievements. For example, the first printing press was established in Moscow in 1553, and in 1555 he commissioned the construction of St. Basil's Cathedral, which was completed in 1561 (see below). Ivan was actually considered an able and intelligent ruler, but was nonetheless subject to fits of rage due to mental illness, which led to his reputation as a madman. His mental instability increased with age, and the death of his wife, Anastasia, in 1560 from suspected poisoning, is thought to have accelerated his fragile state of mind. The Russian nobility (known as boyars) might have been able to keep Ivan in check except for the fact that he conned the Russian people into granting him absolute power. In 1564, he abdicated and left Moscow. This left Russia leaderless and the country began to sink into anarchy. The boyars, fearing total chaos, virtually begged Ivan to return, which he did in exchange for total control. The combination of absolute power and mental instability was a recipe for disaster. The most prominent example was the Massacre of Novograd. Ivan created a secret police force known as the Oprichniki. In 1570, on rumors that the city was planning to break-away, Ivan ordered the Oprichniki to sack it. The rumors were largely the product of the tsar's growing paranoia, but the city was destroyed nonetheless, and up to 60,000 people were killed. His own family was not immune to his outbursts. 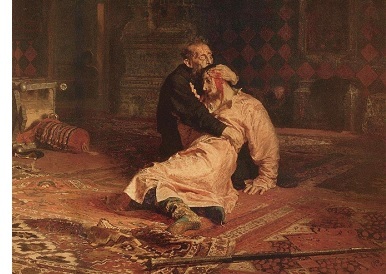 In 1581, he killed his eldest son and heir, Ivan Ivanovich, by striking him on the head with his scepter while the two were engaged in an argument. Finally, Ivan the Terrible instituted the policy of serfdom in Russia by forcing the peasants to work the land. A policy that remained in place for 300 years.